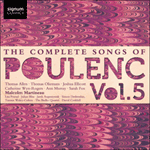 About Le bal masqué, Poulenc never had qualms. ‘To a lady from Kamchatka,’ he said, ‘writing to ask what I’m made of, I would send her my portrait at the piano by Cocteau, my portrait by Christian Bérard, Le bal masqué and the Motets pour un temps de pénitence. I think from those she’d get a very precise idea of Poulenc-Janus.’ Of all his works, Le bal masqué is perhaps the least susceptible to analysis, or even description. The action is all on a surrealist level, divorced from anything resembling causality or common sense, even the made-up popular tunes coming and going without rhyme or reason. The brilliant, often garish instrumental colours ‘underline the bombastic, the ridiculous, the pitiable, the terrifying. It’s the atmosphere of the colour plates in the Petit parisien of my childhood. "Oh Gawd!" my grandmother’s cook would exclaim, "’ere’s annuver bloke wot’s done in ’is sister-in-law."' And at the end of the piece ‘the audience should be stupefied and exhilarated as though they’d just got off a merry-go-round.’ As the critic said of Poulenc’s Max Jacob songs a decade earlier, Le bal masqué is flooded with ‘music, colour, and life’. ou bien chez sa voisine, shin, shin, shin. pour leur mettre des bottines, tine, tine. ils leurs coupent les pieds. plus grosse que le doigt. ont échoué contre la maison. pour en faire des canons. or to his neighhour's, bores, bores, bores. is bigger than his finger. to make cannons out of it. Son gant gris perle est étoilé d’or. près du grès où l’on met les cannes. qui lui penchait le cou. Malvina, ô fantôme, que Dieu te garde! I hope there's something will scare you. Her pearl-grey glove is spangled with gold. in fact, you wouldn't have her by force. Malvina, o ghost, may God keep you! elle ne parle à personne de ses maux. drunk; so she laughs, laughs and then brawls. la peau de chèvre morte. smells of dead goat's hide.